If you would like to read further days in the Restoring Marriages Bible Study, please click here. Our last study was about Turning to God. Today we will look at our faith in God. James 1:6 is a verse that speaks to my heart quite often. Many times we bring requests to God. We may be sincere in our asking and earnestly seek God. However, many times we walk away not believing that God will hear and answer our requests. I am sure you have asked God for help in your marriage many times. You may have asked God to heal your hurts. You may have asked God to help bring change in your spouse. There are just so many things that we ask God! Some things that I have come to God about are forgiveness, healing, help with anger, my husband, my marriage, my emotions, etc. This list can go on and on. But, what we go to God with is not as important as the faith we have in God. Anything that I ask God of, He hears me. But, do I really believe that? How is my faith in God? 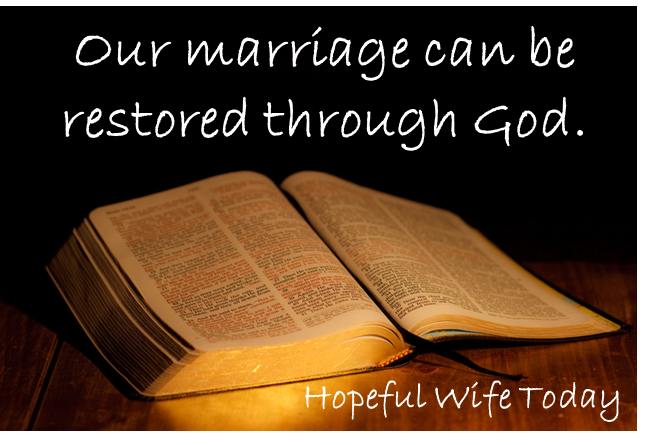 Do I believe that God really wants to heal and restore my marriage? Do I trust God that He can bring back love into my marriage? Take a few moments to ask yourself what you believe about the requests you send to God. Do you have faith that God is working in your situation right now? When you pray, do you realize that our holy God is truly listening? But let him ask in faith, with no doubting, for he who doubts is like a wave of the sea driven and tossed by the wind. God has spoken to us to have faith. We are not to doubt God’s ability in what we ask. Once we come to God and spend time talking to Him about whatever is on our hearts, we are to truly believe. We are to believe that God is working to help us with our request. Have you asked God to come into your marriage? Have you asked God to heal your heart so that you can show true forgiveness? Have you asked Him to guide you in each step during your day? If you have asked those things, now is the time to believe that God is working to grant your request. We already know that a loving marriage is in line with God’s Word. So, now we have to believe that God is putting that in place. Our loving, perfect God cares so much about you that He hears what you are asking Him. He wants to work in your favor and bring blessings to your life. We thank You so much that You hear us. We thank You that You are in our marriage right now. God, You know what requests we bring to You tonight. We ask that You restore our marriage. We ask that You help us to grow closer each day. But, we also ask that our faith grows. God, we believe that You are working in our life right now. You can make anything happen. You can bring blessings into our life. So, God, we will have the faith that You are listening to each prayer we pray. We love You so much and thank You for this wonderful chance to renew our marriage. Can you trust in Him? Is something holding you back from putting your full faith in God? Do you have any encouragement for someone who is having difficulty with faith in God? Please leave your comments below. I am praying for you and your husband. I’m sorry you’re both going through this. I know what you mean because my husband has also experienced a lot of anger. You are doing all the right things and following God through it all. You are an encouragement to me and I know you are to many others as well. Thank you for your honesty. I’m praying that you will both be healed of the impact of negative emotion. God be with you Kayla.